Throughout the history of God’s people recorded in the Hebrew and Greek Scriptures, God’s consistent call is to remember that we have been blessed in order to be a blessing to others, demonstrating hospitality to the poor, the hungry, the displaced, and the stranger. Building on our historic commitment to education and justice, UCF has responded to this call with a focus on three themes of service: hunger ministries and food justice; providing inclusion in all areas of ministry for those with mental or physical challenges; refugee resettlement and the welcome of a wide spectrum of people with diverse theological views, household structure and sexual orientation. While specific efforts have varied over time, these are the recurring themes that guide how we engage our neighbors and the world. Guided by our Community Outreach Pod, we seek to engage people of all ages and abilities. Everyone is encouraged to participate in ways consistent with their passions and gifts, building on the strength of the whole to share God’s love. Through a variety of means we seek to mobilize and strengthen a rich and effective servant ministry. We educate ourselves at all age levels about issues and people in need, as well as appropriate responses necessary to make positive, effective change. Topics have included: hunger, sustainable living, clean water, international relations and peacemaking. 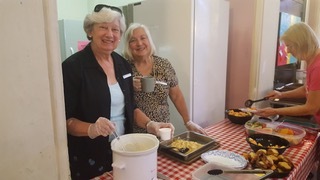 Stewards of funds entrusted to us are used to support identified needs and efforts with generous giving to the community, as well as to underwrite expenses for hands-on congregational experiences such as home repair, disaster response, or serving meals to the hungry. 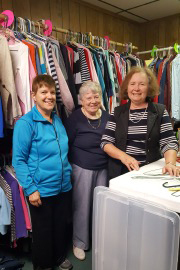 While we respond to emergent needs, some of our long-term partners in ministry include: general mission support of both the American Baptist Churches USA and the Presbyterian Church (USA), Church World Service, F-M Food Pantry, Interfaith Works of CNY, and the Red Cross and Presbyterian Disaster Relief for response to national and local disasters. We also offer opportunities for specific giving for peacemaking, hunger, disaster relief, and participate with groups throughout the community for seasonal responses to those in need. We understand the building is entrusted to us for the benefit of our congregation, its ministry AND its neighbors. 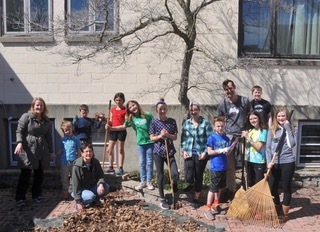 We welcome a number of groups to use our space for nominal donations that maintain and support the building’s usefulness and safety; please see our Church Use Policies page for more information. Those currently sharing our space include: The Village Nursery School, Country Dancers, Al-anon, and the Onondaga Civic Symphony Orchestra, among other more occasional users. We also use our space for the Steeple Coffee House that offers award-winning musical performances to the community for a nominal fee. We strive to develop opportunities to engage our neighbors, near and far, and serve with them, allowing us to build relationships, celebrating that all people are gifted and all people are both servant and served. 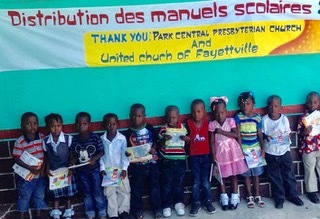 Our commitment to education extends to our Haiti Educational Mission Partnership (HEMP) and our South Korean Partnership, and our dedication to peacemaking to The Presbyterian Peace Fellowship at Stony Point. Click here to see more information about the Haiti Educational Mission Partnership (HEMP). The New York State Adopt-a-Highway Program. Any or all of these efforts may include youth or intergenerational mission trips.